The Coalition for Educational Justice (CEJ), New York City’s largest public school parent coalition, held a rally with 75 parents, youth, elected officials and advocates to publicly release a new curriculum analysis and call for the creation and adoption of a Culturally Responsive Curriculum in New York City schools. ● Ensure that all NYC schools are teaching curriculum that reflects the histories and backgrounds of NYC students, in every course, starting in the earliest grades. ● Develop culturally responsive curriculum with teams of teachers in each subject and grade level, in collaboration with families, students and community. Last April, CEJ won a major victory when New York Mayor Bill DeBlasio announced an investment of $23 million in implicit bias and culturally responsive practice training for all DOE staff members over the next four years. CEJ has called on the NYC Department of Education to ensure that school and district staff represent the diversity of the district’s population, provide classes, curricula and resources designated to celebrate that diversity, cultivate a positive, culturally responsive culture in schools and champion increased parent engagement efforts that are culturally responsive and promote collaborative efforts to help students grow. “As a young Latino student in the NYC school system, I learned a lot about Christopher Columbus, but never about the rich, pre-Columbian histories of nations like Haiti and the Dominican Republic,” said NYC Councilmember Antonio Reynoso in supporting the work done by CEJ. Derrick Owens, a parent leader said, “I never saw Black people in my curriculum as a child, and had to find out on my own about all the incredible things Black people have done, when I got into my 20s. I don't want the same thing to happen to my daughter, but that's what I still see in her curriculum today. She learns almost nothing about Black writers, inventors, politicians and artists, even during Black History Month. Parents have to plan our own events and do our own projects with our kids outside of school to expose them to their culture and history. 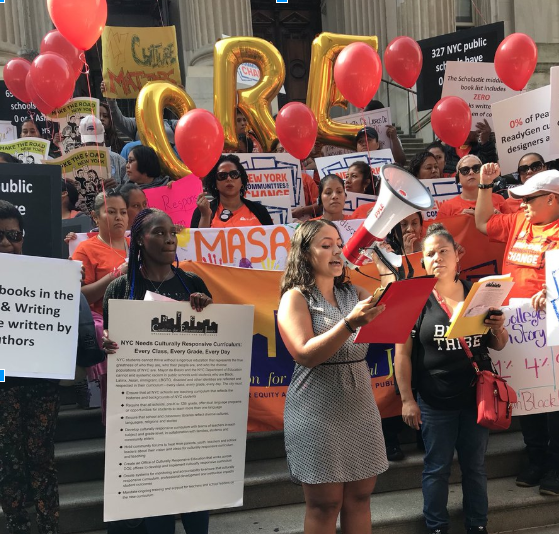 CEJ is continuing the fight to make sure that Culturally Relevant Education will become the standard in New York City’s public schools. In The Public Interest has released a new, short video exploring the impact of charter co-locations—where charter schools are given space inside a traditional public school. The video focuses on California, where co-locations are frequent and increasingly troublesome. Co-locations have also been an issue in New York City and other districts where real estate is expensive and hard to find. Last spring, tens of thousands of teachers took to the streets to call for investment in their public schools. Across the country, waves of walk-outs brought real change in state laws and new funding for schools. Now, the reverberations of those walk-outs are being felt at the ballot box. Spurred by frustration, hundreds of teachers are running for office and public education has become a key issue in the mid-term elections in some states. No one wants "to be characterized as being stingy with respect to K-12 education," Martin West, an education professor at Harvard University, was quoted in Politico (10/1/18) as saying. Funding for teachers and schools is playing prominently in gubernatorial races in Arkansas, Colorado, Georgia, Kansas, Maryland, Maine, New Mexico, Oklahoma and Pennsylvania. Even some politicians who cut their teeth on vicious anti-union lawmaking, like Wisconsin Governor Scott Walker, claims to have had an epiphany on the importance of schools and teachers. This swing in the pendulum on public education seems to be creating energy in Washington as well, with some members of Congress indicating that they hope to press for more funding for public education after the mid-term elections. 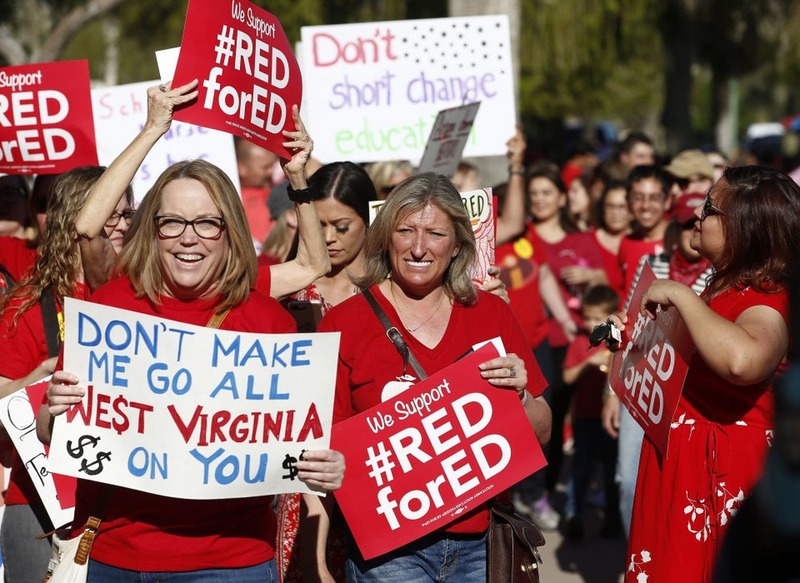 It’s an interesting and exciting window of opportunity, created by the courage of thousands and thousands of teachers, parents and students who hit the streets in red t-shirts last spring. A testament to collective action! President Trump signed the fiscal 2019 spending bill in to law last week. The bill includes an increase of $581 million for the department of education budget, for a total of $71.5 billion. The final bill is a rebuke to Education Secretary Betsy DeVos, whose budget recommendations were largely ignored by the Congress. DeVos had proposed cutting funds to her own department, as well as reductions in funding for some programs and the elimination of others. The new spending bill increases Title I funding from $15.8 billion to $15.9 billion, far from the total funding that could have been appropriated under the law, as the new AROS report, Confronting the Education Debt demonstrates. Special Education (IDEA) was also increased from $12.4 billion to $12.5 billion. On the down side, the federal Charter Schools Program also won an increase, and will offer $440 million in start-up grants for new charter schools (up from $400 million in FY ’18). The spending bill does not address whether states may use federal funding to pay for arming and training educators and school staff. Secretary DeVos has said that she will not get in the way of States that choose to use federal funding to buy guns for teachers. Democrats had attempted to insert language into the budget bill that would prohibit such use of federal dollars. That was unsuccessful, making federal funding to arm teachers likely to be an issue next year in Congress. Read more about the new spending bill HERE. Nine members of the American Federation of Teachers have filed a class-action lawsuit charging student loan servicer Navient with misleading borrowers and diverting them from a loan forgiveness program in order to boost their own profits. The complaint seeks millions in damages and details a range of untruths and misdirection pedaled by Navient to stop borrowers from enrolling in Public Service Loan Forgiveness (PSLF), a 10-year payoff plan administered by rival servicer FedLoan. As a result, teachers, nurses, first responders, social workers and other public sector workers are paying millions more than they otherwise should in student loan payments. The Department of Education, which contracted with Navient to carry out its duties, has stood idly by while complaints against Navient piled up.